You wake up restrained by tough, hempen rope. A crowd full of snake-like yuan-ti look on as a priestess uncorks a vial of green liquid. Two large, lizard-like beings hold you down and force your mouth open. As the priestess pours the liquid down your throat you can feel your skin hardening into scales. You’re turning into a Yuan-Ti Broodguard. The yuan-ti have become a recent interest of mine. Their society is one of magic and savagery which gives it a very unique feeling. They love to hunt other creatures and use them as slaves or turn them into abominations that will do their bidding, such as the yuan-ti broodguards. 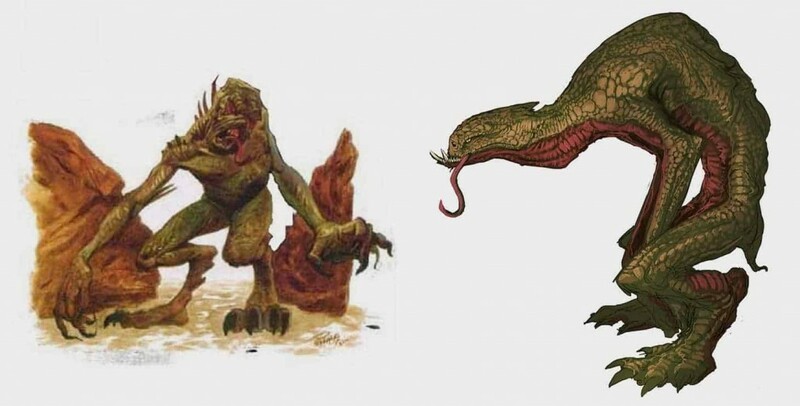 Volo’s Guide to Monsters introduced the broodguards to 5th edition as well as the yuan-ti player race, a ton of yuan-ti lore, and a bunch more yuan-ti creature statblocks. I’ve mentioned in previous Monster Mondays how much I’ve enjoyed VGtM for how it’s expanded on creatures, their lore, and given us some more powerful options for said creatures. The yuan-ti are no exception! Broodguards are somewhat simplistic. They’re a low CR creature with not a lot of unique abilities and have a slightly above-average action economy. However, their lore is where they truly shine. They open up a darker and more sinister avenue for you to showcase the yuan-ti’s disgusting tactics and beliefs. Yuan-ti are known for hunting other creatures, particularly other humanoids. Interestingly enough, they opt not to use the creature for food or other means but instead will capture them and turn them into their slaves. This can be done by charming them with magic, breaking their spirits, or in some cases force-fed an elixir. Yuan-ti broodguards are created by feeding a humanoid prisoner a special elixir. This turns them into the reptilian menace that is a broodguard. However, most of the prisoners that are turned into broodguards appear to be humans for some reason. 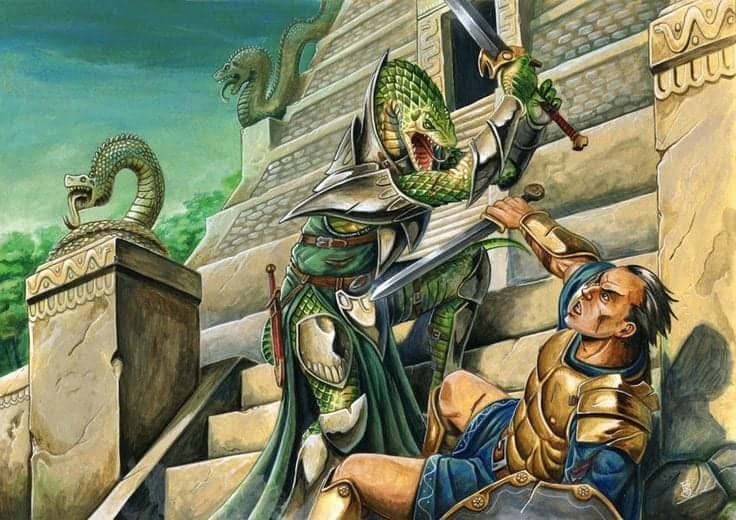 Physically speaking the yuan-ti broodguard is a lizard-like being. It relies entirely on its primal instincts and seething rage when it gazes upon non-reptilian creatures. In the process of its transformation, its mind is warped to obey any yuan-ti that gives it orders or direction. A once independent and intelligent creature becomes a reptilian husk of itself that can only perform simple tasks. Most of the time these tasks are some form of guard duty such as protecting an egg nest. Hence the name, broodguard. While yuan-ti broodguards can speak a few languages, they more often than not will refuse to. This is probably due to the transformation breaking all semblance of independence of the unfortunate human(oid) that was transformed. The broodguards are more lizard-like than snake-like. Perhaps this is due to their unnatural transformation? Art by Wizards of the Coast. You can find the yuan-ti broodguard statblock on page 203 of Volo’s Guide to Monsters. In terms of its statblock the yuan-ti broodguard actually has a solid set of ability scores. Its Strength, Dex, and Con are all above average and its wisdom is neutral. This makes it a hardy creature with a respectable AC for a CR 2 creature. It can also dish-out a fair amount of damage thanks to its Strength. Its Intelligence is poor, but that’s to be expected given its lore. Besides which, Intelligence is very rarely used (if ever) in low-level saving throws and ability checks for creatures. It being a dump stat is by no means a bad thing for a creature. Low Charisma makes the broodguard susceptible to charm spells. Thematically this is a very great weakness since the yuan-ti are well-known for charming their slaves and prey so it makes sense that their broodguards would be weak to these types of spells. However, its Mental Resistance ability gives it a bit of an edge against these spells. These saving throws are fantastic especially for a creature that was created specifically to be a guard. It’s hard to restrain them due to their high Dexterity saving throw bonus, and crowd control spells will be a bit more difficult to pull off thanks to its bonus to Wisdom Saving Throws and their Mental Resistance trait. While they are primarily guards they’re still slaves to the yuan-ti. They may be ordered to do manual labor so the Strength Saving Throw bonus also makes sense. Immunity to both poison damage and the poisoned condition is standard for yuan-ti. They’re snake-like humanoids and many of them have poisonous attacks. While the yuan-ti broodguard lacks this poison they still have the biology to completely negate the effects of poisons. They have a higher than average perception as well which makes thematic sense. They were created specifically to be guards, they should be good at picking out intruders. Darkvision of course also helps with this. Mental Resistance. The broodguard has advantage on saving throws against being charmed, and magic can’t paralyze it. Reckless. At the start of its turn, the broodguard can gain advantage on all melee weapon attack rolls it makes during that turn, but attack rolls against it have advantage until the start of its next turn. Mental Resistance is a great answer to the yuan-ti broodguard’s abysmal Charisma modifier of -3. It gives them advantage against being charmed which is the vast majority of Charisma saving throws. Magic being unable to paralyze the creature means that spells like Hold Person will be completely wasted. This is a huge factor in making a creature that’s well-off defensively even more effective. Its high saving throw bonuses and Mental Resistance are crucial for letting it be a bit more reckless in its offensive tactics. Reckless is just like the barbarian’s Reckless Attack except that you have to determine whether or not to use the Reckless trait at the start of your turn as opposed to when you make your first attack of the turn. You gain advantage on your attacks for the turn, but your enemies have advantage to hit you until the start of your next turn. A classic high-risk, high-reward trait. A typical yuan-ti is snake-like in appearance. They’re even nastier than the broodguards. Art by Wizards of the Coast. Multiattack. The broodguard makes three attacks: one with its bite and two with its claws. Three attacks in its Multiattack is slightly above-average for a CR 2 creature. Its attacks are pretty weak, but having 3 of them per turn definitely makes up for it. This is solid for its action economy as a broodguard has on average 1 extra attack to work with compared to other CR 2 creatures. There isn’t a lot to mention here. They deal an average of 16 piercing/slashing damage per round which is on-par for CR 2 creatures. With a +4 to hit and their Reckless trait, they have a solid chance of landing all 3 of their attacks too. All in all, yuan-ti broodguards are an average CR 2 creature. They deal decent damage, have multiple attacks, and have 1 or 2 interesting traits or abilities to help them offensively. An AC of 14 is perfectly respectable for a CR 2 creature that isn’t wearing any armor. In fact, it’s probably on the high-end of creatures with natural armor. 45 HP is also a solid pool of health for a CR 2 creature. At its base statblock the yuan-ti broodguard is already off to a good start. Then you add in the fact that it has a damage immunity and a condition immunity at CR 2 and the creature looks even hardier. Not only that, but it’s also thematic for the broodguard to gain these immunities through their transformation. This is a creature whose lore translates to its statblock seamlessly. Yuan-ti broodguards are also strong against saving throws in general. It has 3 proficiencies in saving throws, two of which are common saves, and Mental Resistance gives it immunity to yet another condition and advantage against being charmed. Charms being the one glaring weakness of the creature’s statblock prior to gaining this trait. Honestly, there’s very little that the yuan-ti broodguard isn’t prepared for defensively speaking. Their high defensive capabilities already make them excellent guards. They can take a few hits while they wait for the more powerful yuan-ti reinforcements to come to their aid in defending an egg nest. That being said, guarding a position is not all about being able to take a hit or dish out damage. I’d argue that the most important aspect of being a good guard is to be very perceptive. You need to be able to see the enemy and not be easily surprised. With a passive Perception of 12 due to their proficiency in Perception, they have an above-average chance to spot potential threats. For a CR 2 creature “above-average” is really all you can ask for. This is a solid bonus for their tier of play. They also have darkvision which is another benefit to their perceptiveness. They can be constantly on the look-out for enemies at any time of the day and in any terrain. Broodguards are fearsome guards and will do anything to protect their quarry. The Achilles’ heel of the yuan-ti broodguard is their lack of ranged options. Their defenses are good, but they’re not good enough to withstand shot after shot from a long-range archer or spellcaster. They have no way to answer a volley of ranged attacks and that’s a problem. Their defenses give them a bit of breathing room to find cover and hope for the best, but that’s not always an option for a creature who has been ordered to protect a nesting ground at all costs. Their 30 ft. speed is enough for them to keep up with a ranged character kiting them around the battlefield, but they may need to use a few Dash actions to gain any ground on their assailants. It’s difficult to crowd control the broodguards, but if you can get some distance between yourself and them it won’t matter. Pick them off from afar and they’ll be little trouble. They are potentially high-risk creatures depending on how you play them. Reckless opens up a berzerker play style which the purebloods fit quite well in thanks to their great defenses. It may be worth it to open yourself up to attacks made at you at advantage, but you gain advantage on 3 attacks in a single turn. This could be used as a way to drop an enemy quickly or to open up on an enemy and make them think twice about continuing their journey past you. That being said, you’ll still open yourself up to taking some pretty heavy damage. This is not an ideal tactic to use against a group of enemies that have ranged attacks either. You may not want to kill the enemy, but dropping one or two of them first will give your yuan-ti broodguards an advantage in the encounter. The fewer enemies they have to deal with, the better their chances are at winning the fight. Start off the fight by charging at anyone that you can. You have enough Wisdom to determine which enemies are threatening to you. Use your Reckless trait and gain advantage on all 3 of your attacks. You may choose to bare-down on a single enemy and potentially drop them. That’s the ideal situation. Dropping an enemy eliminates them from the action economy. It can also take away an action from another enemy if they use an action to heal their fallen comrade. The fewer actions they can take against you while you have activated Reckless the more the high-risk endeavor pays off for you. That being said, your goal may not even be to drop a character. You may just want to go into a frenzy and deal a large amount of damage to your enemies in the hopes that they’ll retreat. Your job is to guard something, not to fell the enemy necessarily. Either way, once you’ve opened up with a load of damage you’ve left yourself exposed to their retaliation. It may be wise to rely on your defenses and not use Reckless unless you’re certain you can fell at least one enemy when doing so. There are many different flavors of yuan-ti. Some of them humanoid, some of them less so. All of them reptilian. Art by Araknophobia. One pattern throughout this post has been emphasizing that the broodguards are guards first and foremost. 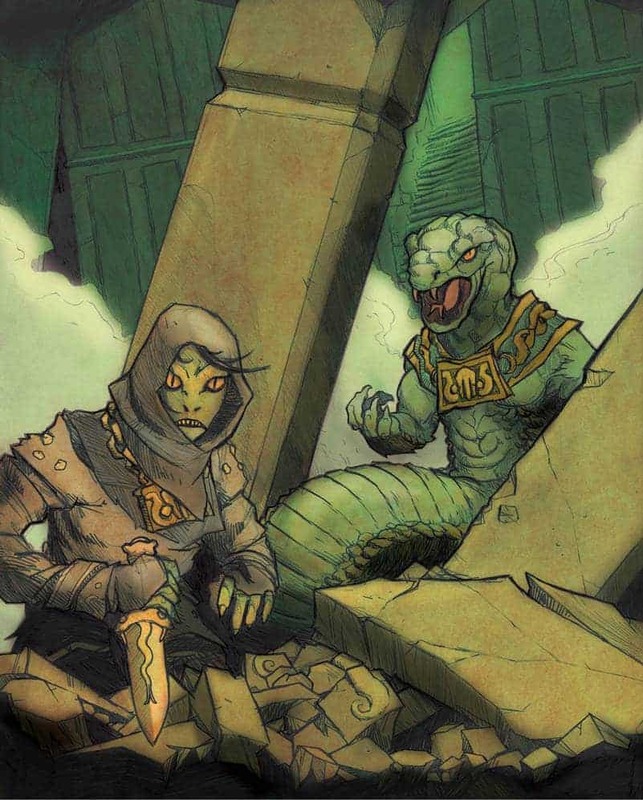 Their primary duty is to protect something or someone that is important to the yuan-ti. Yuan-ti broodguards will not seek out a fight unless they have been directly ordered to do so. Their main goal is to protect whatever it is they’ve been ordered to protect. They’ll willingly – because of the elixir they consumed that took away their free will – give up their lives to defend their goal. In many cases, this could mean that they simply make a lot of noise to alert more powerful yuan-ti to rush to their aid. The broodguards will try to buy as much time as possible until the reinforcements arrive. Their transformation took away their free will and it’s made them slaves to their yuan-ti masters. They are just pawns for the brood. As a whole, I like the yuan-ti broodguard. I think they are an excellent addition to the yuan-ti added in VGtM. 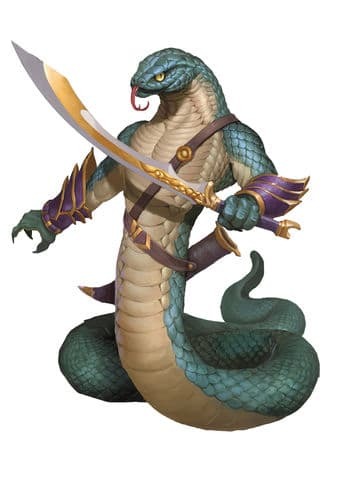 They have unique lore and help to expand how cruel and wicked the yuan-ti are to other humanoids. They’re a shining example of a creature whose statblock translates well to its lore and vice versa. There’s a ton of flavor packed into a CR 2 creature. I’m seriously impressed by it. Their playstyle is fairly standard for a CR 2 melee creature. You run up to the enemy and attack. However, they have some interesting choices with 3 attacks per turn and Reckless. All in all, I like the creature. However, I’d be more likely to include them in a game based on their flavor and lore as opposed to their mechanics and overall power.